New Jersey Premises Liability Attorneys | Tomes & Hanratty P.C. Whether a property owner is a private citizen, a commercial entity, or a municipality, they all have a legal responsibility to ensure the safety of passersby and customers. They must monitor their property for hazards and take the necessary action to fix issues that can hurt people. Most property owners do just that. When a person is injured by an avoidable hazard on someone’s property, the owner may be liable for the aftermath. Even though a property owner is liable for the property, the injured party has the burden to prove that they were injured by negligence. If you are injured on a person’s property, whether it be private, commercial, or municipal, you need to act quickly and contact an attorney to represent your needs. It is imperative that evidence is collected to construct a personal injury case. If you cannot collect evidence, contact an attorney who can send someone to help you establish negligence. If you need a firm that will act quickly to protect your rights and future, contact Tomes & Hanratty, P.C. Most people do not realize the hazards they face when entering others’ property. 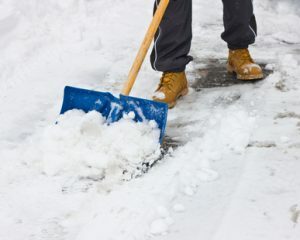 Some of the many dangers you face include unattended snow and ice, substances that are toxic or slippery, building code violations, and unruly animals. If you can prove that a property owner knew about the hazard or should have reasonably known about the hazard, you may be entitled to damages. If you were bitten by an animal, the owner of said animal is strictly liable for your injuries according to New Jersey law if you were lawfully on their premises. It is important to have evidence of negligence if you wish to recover damages. It is paramount that you have evidence that your injuries were caused by negligence. If you are injured, seek medical attention that will tend to your needs and document the injury and the general time and place it occurred. If you can, take pictures and talk to witnesses while you wait for a medical professional. Weather conditions can change by the hour so it is important that you or a representative of a law firm act quickly to document the unattended snow and ice hazard. If you are bitten by a dog, collect information about the animal and the owner. If you cannot collect evidence for yourself, contact Tomes & Hanratty, P.C. to send a representative to investigate the matter. If you are injured because of someone else’s negligence, you should contact an effective law firm to protect your rights and future. If you are suing a private or commercial property owner, you have 2 years to take legal action. If your injuries were caused by the negligence of a municipality, you have 90 days to act. It is important that you make a strong case and having knowledgeable and experienced law firm is in your best interests. If you need our legal support, contact Tomes & Hanratty, P.C. for a consultation today.